Extremely informative! My wife loves your blog! What i love too is the reference links that you have added. Thanks again Akshay. And to Samira too. Must read…specially for all the ladies! Did not know that Assame Saree is called Gheecha…. would love to have one now… please put the picture of the saree as well so that we can have a better understanding….. Thanks Shammi. 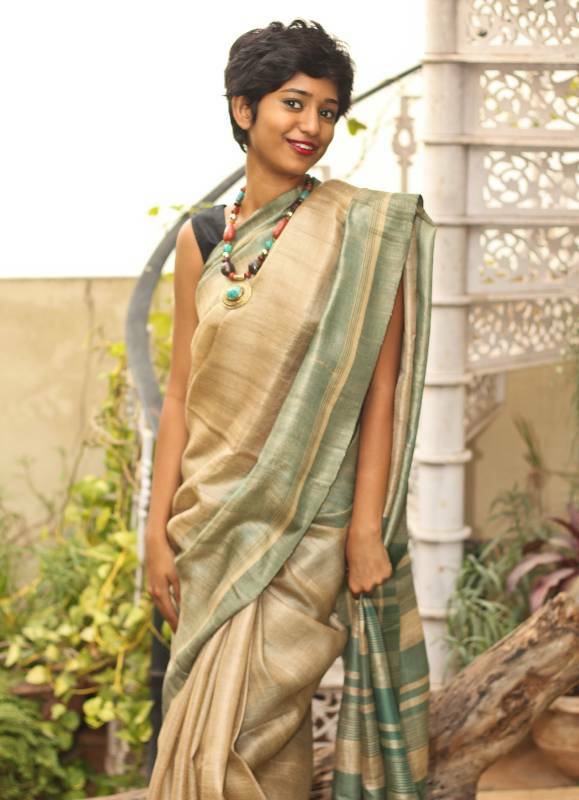 There’s also the Mekhala Chador, usually in cotton or silk too, which is worn as a wrap around or as a saree in Assam. I am trying to source good pictures and will definitely put them up soon. Wow punam this gets more and more interesting. I always loved sarees without being bothered about its origin. Now it will b fun to know , possess and wear. Hi have seen these kind of saris, but had never heard the name Gheecha, its really very interesting…. Thanks Falguni and since they look like Tussar, you don’t feel convinced to buy one since most already own a Tussar. I loved the blog. This was my dream project.Though I must admit that I am too lazy to turn my dream into reality. Hence thanks a ton for collating and putting it all toether. It will also give me reasons to possess sarees I did not know about!! There is something called Endi silk available in Assam. Reading the blog I was confused whether this Endi is called Gheecha. Can you throw some light?Now Gheecha is also made in MP , Bihar, West Bengal, Chattishgarh etc . So is this a particular way of processing the cocoons / extracting the silk threads and hence can be from multiple states? Thank you for the appreciation. To answer your question, Endi silk, sounds like the word ‘Erandi’ – the word for castor, so I guess it would be the same as Eri silk or Gheecha silk. You are right about Gheecha silk now being available in other states as well. My understanding about Gheecha’s soft texture is that it is made from the Eri plant. Tussar cocoons also come out the same way as in Gheecha – due to which the filament is ruptured and we get short, coarse yarn. The difference however is that Tussar is made from leaves of Oak and Juniper – hence there is also a silk called Oak Tussar. Other than this, I too am not an expert, just some one who cares enough to read about it – usually from Google. If I get any other information which throws light on your question, I will definitely update the blog. Thanks again for posting a comment. Matka silk is also 100% pure silk. In this, the yarn in warp is the usual silk yarn, whereas the yarn in weft is obtained from the cocoons that are cut open by the moths as they emerge. Later after they have laid eggs, these moths are crushed to death. Recently with a view of selling this silk under false pretences of it being ahinsak or involving no killing, it is being marketed as Endi silk.